Seche Vite has quickly become one of my favorite products. Their base coat which I use exclusively now, dries fast, lasts, and more importantly does not allow bleed through with polishes. Their top coat is amazing - very fast drying, shiny, and long lasting. I have read of other bloggers having problems with Seche Vite top coat shrinking and "peeling up" on them, but thankfully I've never had that happen. I did have one bottle of top coat get thick on me, but once I used some Seche Vite Restore (which was given to me from the company), the top coat worked just fine again. I do follow Seche Vite on Twitter [official Twitter page] and back in early January, they tweeted about their newest product Seche Natural Matte Finish Nail Treatment. My ears perked up. According to the box, "Seche Natural strengthens weak nails with wheat protein and calcium. 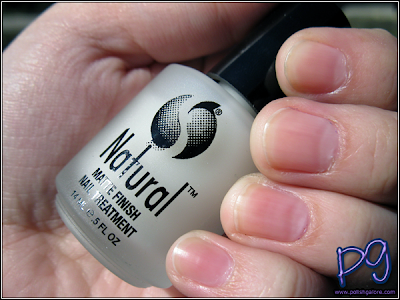 Ideal for a natural looking matte finish when worn alone or may be applied under polish as a nourishing base coat." I began a wild goose chasing trying to find of any store in my local area that had even HEARD of this product, but no one had, but I found it on TransDesign [official website] for $4.20 - not bad. Thankfully, I was blessed with strong nails - no peeling or splitting here, but I figure this can't hurt. I want to wear it on days that I don't have polish on, or maybe alternate between Natural and Seche Vite's Crystal Base Coat for awhile. To be honest, I didn't notice that much of a matte finish over my natural nails - this is one coat. Maybe with longer nails, you'll be able to tell the difference. Is it bad that I haven't tried Seche Vite yet? I am trying to finish up my other top coats before I try it.
! Yes it's horrible! :P Did you enter my 100 Followers Giveaway? I'm going to give away a bottle of their Top Coat. Can you get this in stores? Yep! I've found it in Trade Secret before and even in CVS Stores!